Are you living with the following symptoms in your shoulder: stiffness, decrease in range of motion, inflammation and pain? You could have frozen shoulder, also known as adhesive capsulitis. The condition known as ‘frozen shoulder’ got its name because the more pain that is felt, the less likely a shoulder will be used. This lack of use causes the strong connective tissue surrounding the shoulder joint to become thick, stiff and inflamed. Without a proper physical therapy protocol designed to loosen the tissue, the shoulder can remain ‘frozen’ for up to three years. Brad McMahon, licensed physical therapist with Peak Performance, is a recognized resource for helping patients improve their frozen shoulders in a matter of months. His approach centers on a patient-centered treatment protocol and close relations with orthopedic surgeons and primary care physicians. Brad’s patients each have a different set of circumstances that led to their frozen shoulder condition. The common thread among them is the need for physical therapy to help relieve the shoulder pain. Frozen shoulder does not go away quickly on its own. In order to help our patients understand what frozen shoulder is, we walk them through the definitions of the three stages. As their physical therapy partner, our goal is to help them get to the recovery stage as quickly as possible. In this stage, the shoulder becomes stiff and is painful to move. We assess the severity with a measurement tool called a goniometer. We measure shoulder flexion, external rotation in two positions and internal rotation. In this stage, pain may lessen, but the shoulder remains stiff. This makes it more difficult to complete daily tasks and activities. When the shoulder is frozen, the key is to help them with proper mobilization at our clinic. It is important for our patients to know and respect that strengthening exercises are not part of a treatment protocol during this stage! In this stage, the pain lessens and ability to move the shoulder slowly improves. Once motion is full, we add rotator cuff strengthening and scapular stabilization exercises. 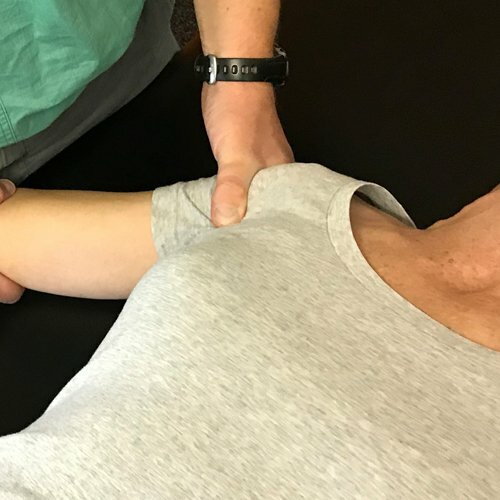 At Peak Performance, we take great care in knowing each of our patient’s history and develop a frozen shoulder treatment plan that is achievable and sustainable for them. The results are best described by our patients. If you or someone you know could benefit from a frozen shoulder assessment, contact Denise or Paula (patient care coordinators) at (920) 738-0671 to schedule a free 15-minute injury consultation.